I got a little matchy-matchy here maybe but I think it’s going to be pretty. Started out with three Eggplants, purple stems and green leaves, but I needed some fillers and went over to the nursery looking for herbs but ended up with a variegated sweet potato, green with a purple edging on the leaves, a bright fuschia geranium, and the other thing, one of those new petunia looking plants whose name escapes me but this one has purple flowers. It’s portable so I can move it to mow and, like I said, I think it’s going to be pretty once it fills out. My whole garden this year is in pots and …er… stuff. 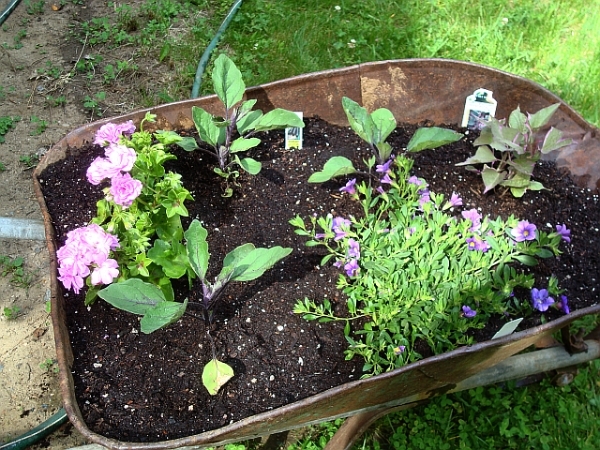 lol I have Pop’s old cement wagon with tomatoes and nasturtiums, more tomatoes in large brightly colored tubs (the tubs were given to me) and assorted other veggie plants in large flower pots. The peas are in the flower bed and not doing as well as I had hoped. Peas do well in cold weather so I thought this would be the year for them. I actually built a fire yesterday as it got down to 39 Thursday morning! In June! Well, sorry I have not been posting like I ought, Randy has been gone this week and Cori and I have been goofing off. She slept in to nearly 8am yesterday!